Amazing North Hall home is a Gardener&apos;s dream offering peaceful seclusion, relaxing outdoor spaces & over 300 types of flowers/plants. The almost 11 secluded acres include a lovely bubbling stream, raised gardens, fruit trees, new pole barn & fenced area great for small livestock. 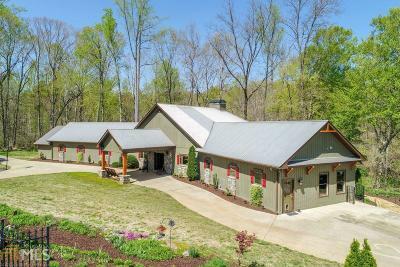 Main house features open floor plan - perfect for family living & entertaining. Kitchen has tons of custom cabinets, island with breakfast bar, huge walk-in pantry, SS appliances & solid surface counters. Master Suite has recent addition of a sunny sitting area & must-see tiled bathroom. Separate detached garage/workshop has fully appointed apartment with full bathroom & kitchenette. NEW hardwood floors throughout, landscaping, gutter guards, shutters, interior & exterior paint.